You can have multiple start up projects, 1 for each client or organization. Your suggestion not bad. But in future we might have >100 clients. Whatever development we do, we have to copy that in all projects & that would be pain for developers. Not all projects. If you have 100 clients, then you have 100 different startup projects, 1 for each. All your other projects remain the same. Put the start up projects in a solution folder to make it easier to manage. All common code stays in the existing normal projects, those changes you only do once. Sorry but I am not getting your point .Could you be more precise. As I have written my requirement in question itself. & how can I integrate 1 android project to another(start up) since you are saying to do so. We can have different account too for each client. Not sure how I can be more precise. Create a new app project. Set the properties for it (different icons, splash screens etc). Add the code to run your main code that is in your common projects. Right click on the new project in the Solution Explorer, and set as Start Up project. Build, deploy etc etc. 3) Add the code to run your main code that is in your common projects--How to do that? Here in step 3 what should I add .dll, .sln or .csproj. 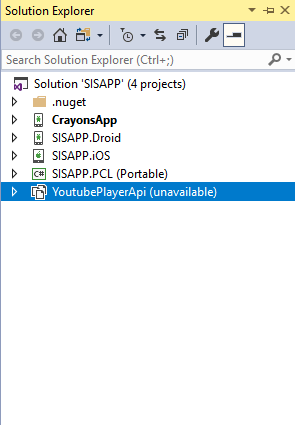 dll making not possible from android projects. Or Common code project should in same solution? Yes I'm sure, its how I do it. You already have an app right? iOS and Android? You will already have a startup project selected in Solution Explorer. Look at that, just add the same project references and entrypoint code. Be more realistic. See my solution explorer & give me a hint to add SISAPP.Droid project (this is common project) reference in CrayonsApp which have only relevant information about client. If you are getting what John saying, you can help me out. In your screenshot you can see that CrayonsApp is your start up project. You should probably name that for what platform it is for btw. Create another project, call it CrayonsApp.Client1.iOS for example. Set it up like a new app with the client specific details. Add the same project references as the current start up project. Have the same start up code. Right click on it to set it to be your start up project. Build it. That is then your client specific app. Do you not know how to add project references? Sorry, but I am not here to teach you basic Visual Studio usage. If you don't understand these instructions then I cannot help you any further. Sorry for asking silly questions I was out of context . Now I got that I have to add dll of my common to Clients app. I have done so, still facing few issues. Please have looking on this thread. I got this issue after following your procedure only.